Please welcome the multi-published author, Gemma Juliana! She's here to talk about holiday recipes and her new release, Autumn Masquerade! So, check out the cover, blurb and excerpt from her exciting novel below her post! She also has a fab recipe to share with you and maybe you have a special one to share with us too! What a delightful time of year this is! Thanks, Lisa, for inviting me to post on your blog. Many countries around the world have special recipes for the winter holidays, often tied to Christmas, Hanukkah, Kwanzaa and the Winter Solstice. My own memories are of Irish Christmas feasts prepared by aunts and grandmothers who are no longer in the land of the living. One dessert in particular brings back many memories, and has often found its way onto my own holiday table over the years, so I thought I’d share it today. Irish Sherry Trifle is easy to prepare and will impress even your most critical guests. The traditional recipe incorporates alcohol in the form of sherry, but if you wish to make a non-alcoholic version you can omit the sherry and use apple cider or berry juice. There are as many versions of sherry trifle as there are weeks in the year, so don’t get too hung up on staying ‘authentic’ – get creative! You can make a quick and easy trifle by purchasing a pound cake, lady fingers, sponge cake or a jelly/jam roll. Cut into slices or cubes and position into a large glass bowl. Arrange pound cake in the bottom of a glass serving dish and drown it in sherry. Place sliced bananas on top. Pour jello mix evenly over the cake and bananas. Top with custard or pudding, and then crown with whipped cream. You can sprinkle a few bits of nut on top. NOTE: Prepare ahead of time so it can steep and the subtle flavors blend. It should be noted that many a family goes heavier on the sherry. That’s a discretionary matter, but you can’t go wrong with this easy, elegant and delicious dessert! My novella Christmas Spirits takes place in an ancient Irish castle called Winterthorne. I imagine a traditional sherry trifle will be served up on Christmas Day when the royal families come together in shimmering candlelight to enjoy a buffet banquet. A fire will crackle and burn brightly in the hearth as laughter and song fill the air and echo through the lonely halls of the old castle. As generations gather, both in the flesh and in spirit, they bring life back to the old castle. Christmas Spirits is a love story about an undying love that transcends time and space. It’s a tale of finding the courage to do whatever is necessary for those we love. Do you have a special holiday recipe? You needn’t provide the details – just the name and maybe what makes it so special for you. I wish each and every one of you a very happy holiday season. Cherish those you love, and make many memories! An isolated Irish castle, blanketed in snow, is the perfect place for a romantic ghost story of undying love that transcends time and space. When young Queen Anna dies before her time in the arms of her beloved husband Sheikh Khazan, she promises him she will return in spirit to spend every Christmas Eve with him. She keeps her promise until this year, when her desire to experience physical love again with her true love tempts her to bargain for the great gift of a physical body for the holidays. But the price she must pay means this will be her last visit, ever. Does Khazan love her enough to accompany her when their final bittersweet weekend together ends? Anna Spencer has a successful corporate career. She learned long ago that her psychic gifts needed to remain a secret if she didn’t want to risk ridicule, rejection, and losing those she loves. Richard Bentley, her boss, is a widower still plagued by guilt. He rented the private jet two years ago that crashed just before Thanksgiving and took his beloved wife away forever. Anna has been falling in love with Richard little by little. She is unaware that he, too, has been falling in love with her. If time heals all wounds, will he move beyond the guilt and grief that has consumed him for two years, to live and love again? 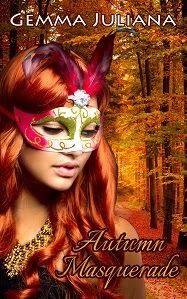 When Anna is forced to use her psychic gifts at a friend’s Masquerade Ball, her secret collides with her daily reality. Richard will attend the event as his first social engagement since Eva died. Communicating with the dead is Anna’s greatest gift, and Richard’s deceased wife has messages for them both. Anna must face her fears and not let them consume her. Will he fire her if he finds out? Even worse, will she lose his respect and friendship? This is an 11,000 word novella with a PG-13 rating – it is appropriate for all audiences (one kiss only). 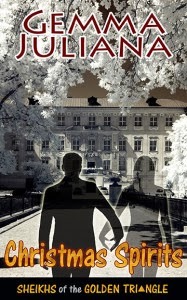 It is a holiday romance, and focuses on the season of autumn, the themes of Halloween, Thanksgiving, and gratitude. Gina picked a table on the terrace and they ordered Caesar salads with grilled chicken and white wine. Anna almost choked, and started coughing. “Easy does it, kiddo.” Gina reached over and patted her on the back. “Sorry, I didn’t mean to choke you. Wow, are you okay?” As Anna’s coughing subsided, Gina resumed her grazing. “Maybe by then you won’t.” Gina grinned at her, a twinkle in her eyes. For a twenty-eight year old woman she looked barely older than eighteen.